My wedding colors was something I didn't make a final decison on until I started wedding planning. Even before I was engaged, I would think about what my colors would be. When I thought I knew, I would change my mind again. My favorite color is pink, but I didn't want that to be the main focal point, since I wanted to find a color that Kwang would like too. We decided on a royal blue with silver at first. It moved onto tiffany blue, and robins egg blue. After I got engaged, I discussed wedding colors with my friends, and it seemed like all of them also had a shade of blue in mind. I didn't want to have a color that everyone else would have (even if I am getting married before most of them) so I went back to drawing board. Finally, the color mint came to mind. It was perfect. It's a unique color with a blend of blue and green (there are so many variations of it, a cool ice blue to a green sage). 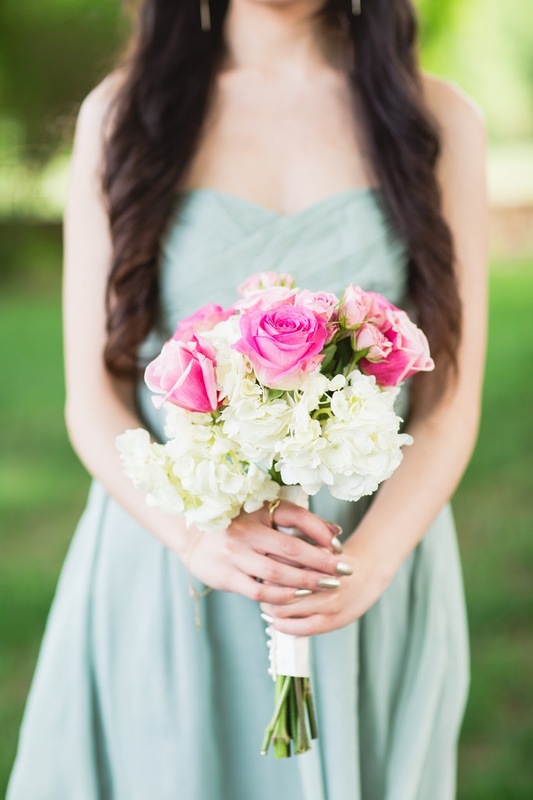 It seems it is a popular and modern wedding color nowadays. 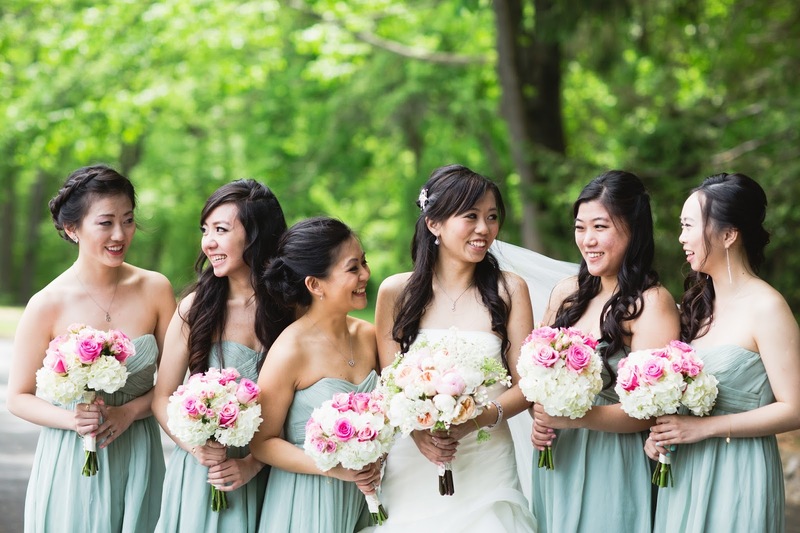 I think the focal point of your wedding colors in the eyes of guests is the bridesmaid dresses. I searched long and hard for the perfect shade and most affordable price (read about my search HERE). I designed pink and cream bouquets as the accent wedding colors. The bouquets had a few bright pink roses to add a pop of color. 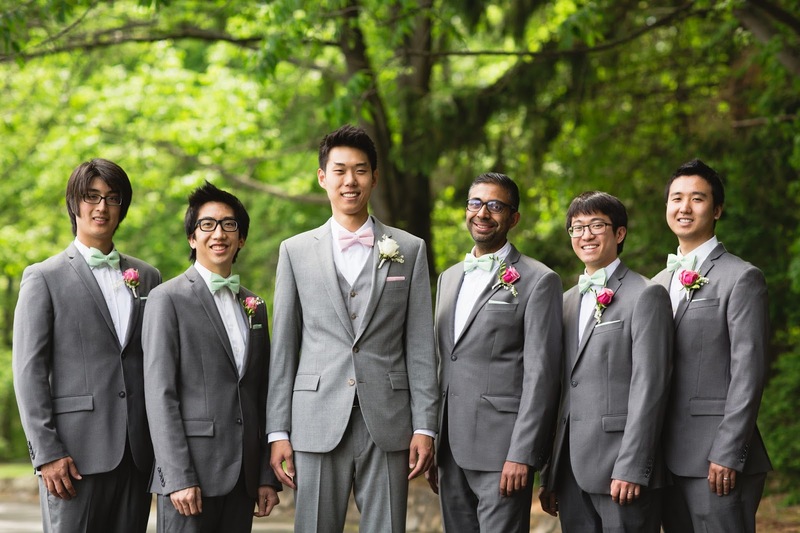 The groomsmen wore handmade mint bow ties while the groom wore a light pink one. They also wore a matching pocket square. Future tutorial to come. 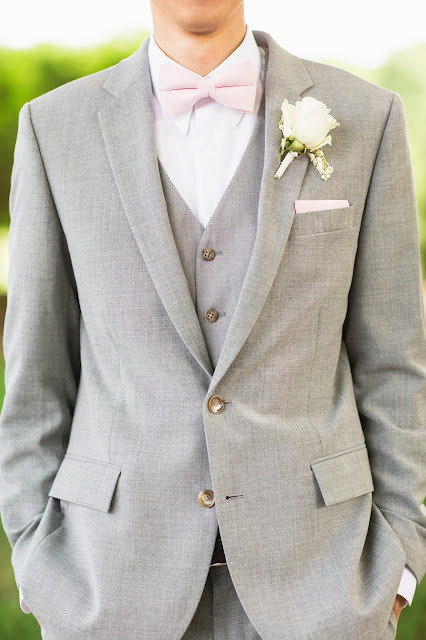 The pink boutineer from the florist was brighter than I expected for the groomsmen but it looked ok after seeing the whole bridal party come together. For my bouquet I wanted it to be different and have a rustic look. 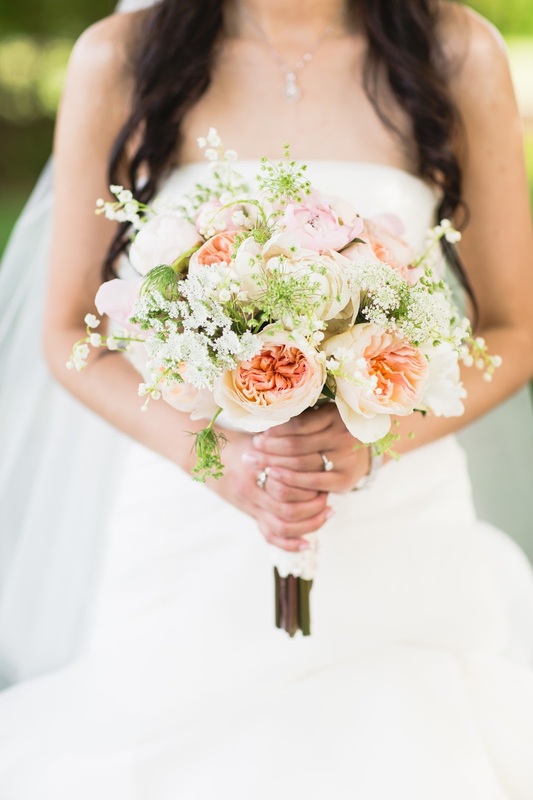 I included pink and cream peonies with peach Juliet garden roses. 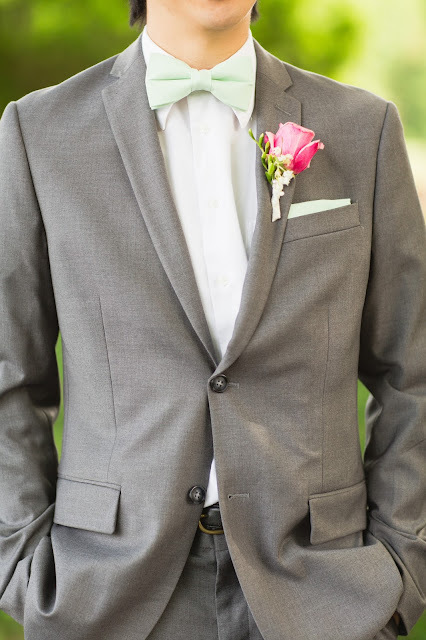 Besides the bridal party, I laced my wedding colors throughout the wedding day. The caketoppers, wedding favors, photobooth and menu logo, and our drink station all incorporated our wedding colors. At the end of the night, a guest said to me "I didn't realize how much wedding colors mattered until this wedding" That made me really happy, that guests were able to notice how wedding colors can play a big role on your wedding day. I really love how my drink station came out. I took an old wooden cart from my basement and spray painted it white. Do you see the subtle color hints even in the drinks? 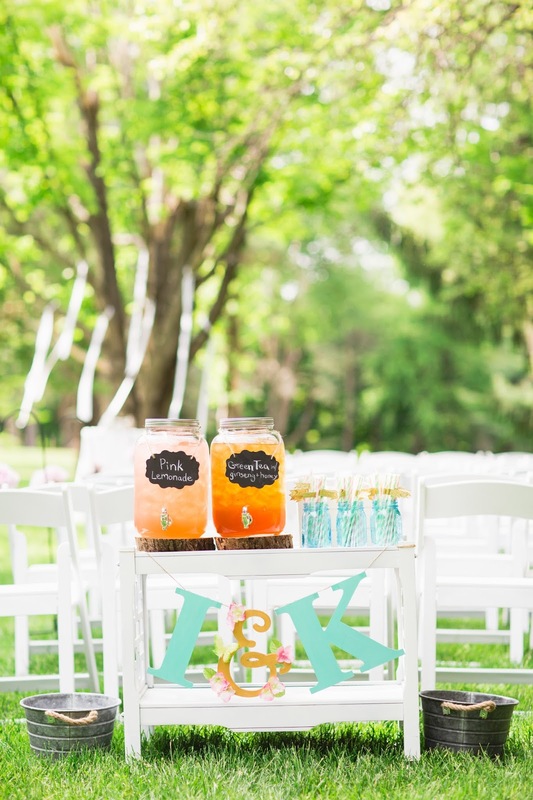 The mason jar drink dispensers had Pink Lemonade and Green Tea with ginseng and honey. They were placed on top of 2 wood slices that I got from A.C. Moore. I used a grey wooden box to hold clear plastic cups. I used 3 blue pint mason jars to hold mint and pink striped straws with gold glitter flags that we made. I couldn't find more rustic pieces in time to decorate the bottom of the cart so I used the wooden I & K sign that my friend made for my bridal shower. The colors and setup of this decor looked really great together. Yeah dear, I also had planned a wedding at best New York venues myself and invited couple of friends and family. I faced some problem during planning games but all in all it was fun and co-incidentally I also used the same color.